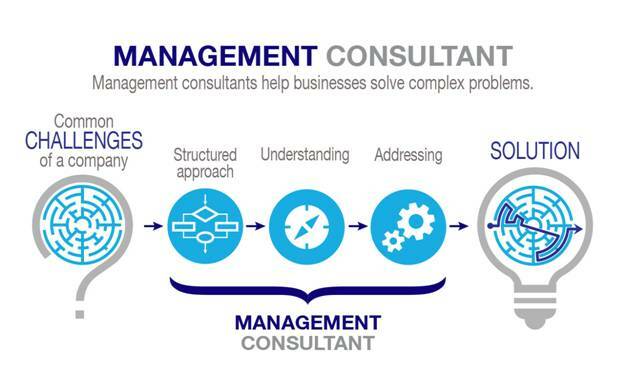 Spanning across private and public sectors, management consultants help businesses solve complex problems. They take a structured approach towards understanding and addressing common challenges that a company might face. Putting the entire profession into one sentence is difficult because consultants work on a wide range of problems. Their aim is to provide effective solutions that help companies grow and save on costs. Being a management consultant can be exhausting, but also very rewarding. If you are interested in this career, it’s a good idea to know what you’re getting into. But, don’t be intimidated if you don’t fit the bill exactly. 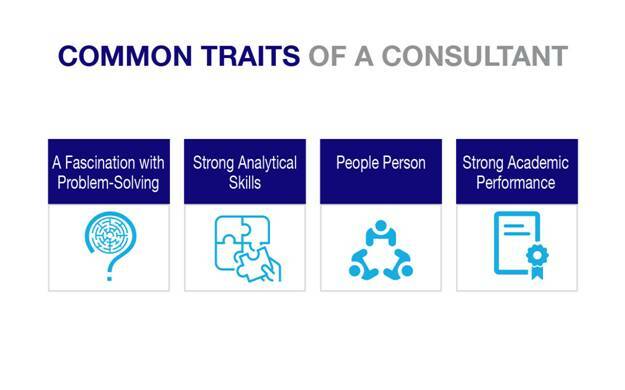 Some people have a natural inclination towards consulting, while others develop their skills over time. Either way, every person’s journey is different. That’s what makes management consulting so rewarding — you’re able to use your own unique approach when working with each client. As you consider this career, it helps to understand the key responsibilities of a management consultant. What exactly do management consultants do? As businesses grow, they are face some complex problems. Before they can solve those problems, they need to define them. Many businesses struggle to identify the specific problems that they’re facing. For example, a retail store that sells toys may be wondering why they’re not attracting enough customers. The company knows that it needs to increase sales, but it may not be aware of what’s impeding the growth of sales. A management consultant can step and observe the situation and identify exactly where the challenges lie. By getting to the root cause of the problem, management consultants can work towards implementing an effective solution. Once a problem has been clearly defined, consultants can use their problem-solving skills to develop a solution. Management consultants tend to start with a specific and structured approach to problem-solving. This may involve using processes such as MECE(mutually exclusive and collectively exhaustive) to clearly define the scope of the problem that a business is facing. Management consultants also use asset-based technologies (relying not as much on human talent but tools and business models and using technological innovations) to assess business challenges and to implement possible solutions. An important part of the problem-solving process includes observing the current practices of a business. As a consultant, you will often travel to a client’s location to assess how they’re currently doing things. You will use that time to collect data and then analyze it to identify any areas that have room for improvement. If you have a love for problem-solving, this profession may be a good fit for you. Many management consultants enjoy asking questions, analyzing why things are a certain way, and drawing relationships between sets of data. After analyzing the current processes of a business, a management consultant will recommend an action plan for improvement. You will typically work in collaboration with the client to develop an effective plan for implementation. Each action plan is unique to match the needs of the client. Although you may use a structured problem-solving approach, the final action plan will largely depend on the operations of the business. 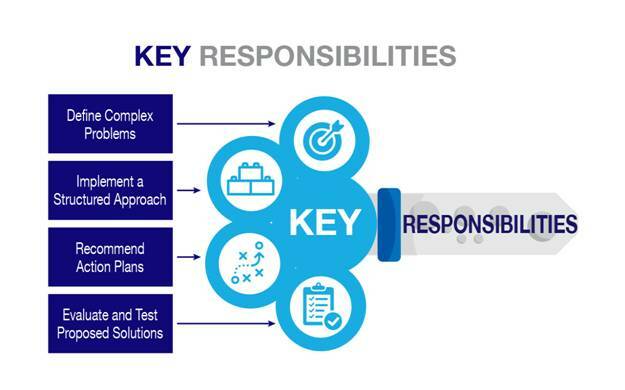 After an action plan has been implemented, you may also be responsible for evaluating its success over time. Management consultants often visit client sites to collect data and make sure that their proposed solutions are actually working. For example, if you proposed a retail toy store should also carry children’s clothing (to attract more customer traffic), you may visit the store to collect sales data and insights into customer behavior. Through evaluation and testing of proposed solutions, consultants will be able to see the effectiveness of their action plans and adjust them if necessary. Now that you know the key responsibilities of a management consultant, you may be wondering what your daily schedule will look like. Management consultants don’t necessarily have set 9-5 schedules like you see in most professions. That’s because most consultants travel on a regular basis. As a management consultant, you frequently visit client sites to follow up on various projects that you have in the works. You may find yourself handling several projects at a time, each with its own set of responsibilities. Some consultants spend Monday through Thursday on the road working with various clients, then take the weekend off or spend it catching up on data reconciliation (or developing action plans). As you begin working with a client, you will often spend the first few weeks collecting data. This may involve interviewing employees, analyzing business processes, and putting data into a spreadsheet. During this stage, you will probably spend more time on the site of the business. 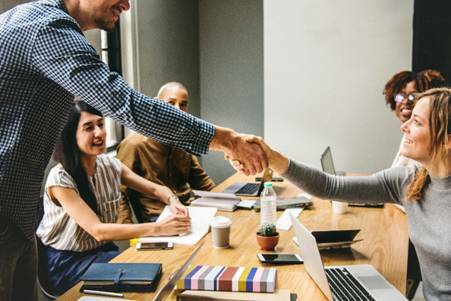 If you’re working with a team of consultants, time on the road can help cultivate healthy professional relationships and offer a lot of networking opportunities. But, keep in mind that you will also have very busy days while you’re at client site. You will often arrive early and stay late working out solutions for your client. Management consultants come from all walks of life. They have varying personalities, specializations, and preferences. However, there are common traits that tie these professionals together. You may be able to pick out a management consultant by recognizing some of these underlying traits. Most management consultants are driven towards understanding and solving problems. From a young age, they find themselves curious about different parts of their environment. For example, when they encounter a puzzle or riddle that others have already given up on, they spend more time trying to solve it. The just can’t seem to let it go.They may also question why certain things are the way that they are. Why do gas prices keep increasing? Why is the local fast food restaurant always busy on Monday nights? In the consulting profession, this skill is essential in helping clients improve their business operations. Management consulting is a data-rich field. Data is the foundation of problem-solving. You can’t expect to give good advice to a client if you don’t have any information to base it on. Collecting and analyzing data is a key responsibility of management consultants. They frequently work with data analysis programs to help them find unique relationships between variables. If you find yourself evaluating and reevaluating data, even in your free time, this field may be a good fit for you. Strong analytical skills allow you to turn raw data into solutions.Consultants need to be able to identify problems and evaluate the effectiveness of action plans. Are you good at communicating with people? Do you have strong networking skills? Good people skills will help you immensely as a management consultant. As a client, a good interaction with a consultant builds trust. They become more confident that the consultant can solve their problems. You need to communicate clearly with various stakeholders as you work on a project. Successful management consultants enjoy interacting with people, listening to their perspectives, and brainstorming solutions. A good relationship with your client goes a long way towards finding solutions. Consultants should know how to talk to just about anyone.It helps them adjust to a client’s behaviors and preferences. If you’re a likable person, trustworthy, and reliable, you will find these traits very useful in consulting. Management consultants are smart and hardworking professionals. Most firms only recruit the strongest academic performers to be consultants. New hires directly from college typically have GPAs of 3.5 and above from well-known and accredited institutions. In addition to academic performance, management consultants have a strong track record of professional experiences. This starts from the internship level where they engage in meaningful projects that produce tangible results. Management consultants don’t hold a specific position or carry out recurrent tasks. Each client is unique, and each solution or action plan has to be equally unique. Experience gained from internships and previous positions will lay the foundation for future consulting work. If you look at a management consultant’s resume, you will notice that they have specific achievements that are quantifiable through numbers or milestones. 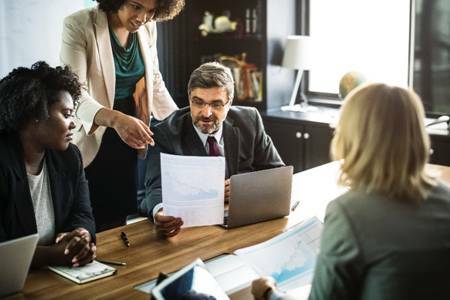 Before any business decides to hire a management consultant, they’ve probably faced a recurrent problem that’s impeding growth. Some clients may be fully sold on the action plan that management consultants want to implement, while others may remain skeptical. It’s not uncommon for the client to contest your specific proposal. Therefore, working with clients requires patience and understanding. Each client’s problem is different and demands a customized approach. You will need to provide data-driven solutions to their problems. Data, along with strong presentation skills, will convince skeptical clients of the effectiveness of your proposed solutions. Confidence in yourself also goes a long way in these situations. If you’re not sure of your action plan, your client will be able to tell. In most cases, management consultants start off as members of larger firms. These firms are as varied as the consultants who work for them. Firms may focus on business strategy, financial planning, HR, marketing, or other relevant areas of a business. Most of these firms recruit graduates straight from college or business school programs. If you’re in the beginning stages of your educational journey, it’s a good idea to look into a few firms and their recruiting requirements. This will give you a good idea of the grades and professional experiences you will need to show on your consulting resume. In cases where a firm mostly hires working professionals, you can look into networking with those already in the firm. Seeking out alumni from your school is a good place to start. Connecting with professionals within the firm can give you an insider perspective of the work that they do. Consulting firms that deal with business strategy focus on long-term planning. They may advise a business regarding the best location to move to or how to reorganize their company structure. These firms also assist with product decisions and company appraisals. If this area is of interest to you, you can look into business strategy firms to find out what type of talent they recruit. Financial consulting firms are among the most common. They advise clients on budgeting practices, revenue and profit planning, and investment decisions. Financial consulting involves analyzing a business’s financial statements, daily operations, and administrative techniques. They can then use this data to provide sound financial advice. Talent recruitment has become a top area of concern for businesses. Companies want to ensure that they hire the best talent without spending too much during the recruitment stage. Human Resource consultants provide critical advice on how businesses can manage their personnel. They also propose plans that cover job enrichment programs and the evaluation of workers across various industries. If you enjoy working with people and understanding their needs and concerns, Human Resource consulting may be a good fit for you. Providing innovative solutions to personnel management is a valuable skill in Human Resource consulting firms. Businesses looking to grow often hire marketing consultants. These consultants provide insights into the current market conditions and propose approaches for attracting new customers. When working as a marketing consultant, you can expect to carry out extensive market research and sales forecasting. You may also participate in new product development so that each item produced is tailored towards the needs of customers. Technology now lies at the heart of most business operations. Information Technology systems are used to drive manufacturing, provide better services to customers, and collect important business data. In fact, company-wide Enterprise Resource Planning Systems now exist to provide a centralized platform for the entire business. As an Information Technology consultant, you will work with clients to implement technological transformations, Customer Relationship Management systems, or other applications that can boost efficiency. You will also find that Information Technology firms prefer candidates with practical skill sets and hands-on experiences in solving Information Technology-related problems. tests your ability to solve a hypothetical client problem. Depending on your performance at this stage, you can qualify for an interview with the recruiting team at the firm. Networking within the firm before you apply is always a good idea.As previously mentioned, seek out alumni or friends of consultants within the firm. The more the recruitment team gets to know about you and your skill set before you apply, the better your chances are to land an interview. Management consultants who have years of experience in the field often end up establishing their own private practice. These independent consultants have networked extensively with clients over the years and developed a reputation for excellence. Rather than working as a part of a firm, they are hired directly by businesses to help solve complex problems. As veterans in the industry, independent consultants can work with more flexibility than those who are a part of a larger firm. They also earn better pay for their projects due to their years of experience. You can compare independent consultants to doctors that open their own private practice. They get more control over their work and slowly build a solid customer base. Now that you have a solid understanding of what it takes to be a management consultant, you may be asking yourself if this is the right career path for you. As you get started, keep in mind the responsibilities, skills, and academic performance that the profession requires. How well do you stack up? What areas do you need to work on? Also, start evaluating our own behaviors. Do you find yourself unable to walk away from an unsolved problem? Are you a people person? Do you enjoy traveling and adventure? Do you have a strong academic performance? Comment below with your thoughts. It looks like there is a small data issue in ur email – If we assume, Population of US is 300M, then $26B is $87 Per Head. Isnt it? Victor mentioned $36b, not $26b so $120/head is correct. However, I’m sure you already figured it out.